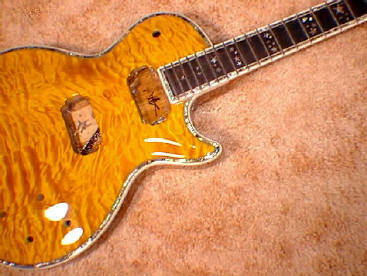 A Conversion is a stock guitar that has been either rebuilt, reconstructed, re-carved, redesigned, reworked, refretted, reassembled, refinished or all of the above. If you desire in many cases all the original parts can be kept so that in the future the guitar could be put back to stock. What if I Take My Guitar Apart and Reassemble it? Is it Still Original? In the strictest sense, no it is no longer original. That means of course that there are absolutely no original 60’s Fenders out there because they have all been taken apart 5 to 10 times to get the dates and other information from inside them. Why should re-finishing change the originality and re-assembly not change the originality? I suppose if you hunted around Southern California. Say that you located Hector & Jose that originally built it & say you had them reassemble it. I would have to reluctantly call it original then. A cosmetic conversion is either a paint job, or a body style change. Pointing out a few notable examples. The candy-stripe Van Halen style is a stock Kramer Baretta converted by paint. I specialize in rock-star signature paint jobs. I do Zakk Wylde’s shattered glass Les Paul, Eric Clapton’s psychedelic SG, George Harrison's Rocky, be bop a lula, Paul Stanley's PS-10 Iceman Mirror ball guitar or his BC Rich Mirror ball Warlock where shattered mirror is actually glued right on the face of the guitar. A tone-wood Conversion on an electric is a new body made from presumably more resonant wood than the original manufacturer could afford to use. Typically all major guitar makers buy lumber in bulk. It is simply the only way they can economically produce an instrument that is affordable to the general public. Major manufacturers simply cannot pay attention to details like specific moisture content, book matching, beauty of wood, They never use one piece body construction, it's just too expensive. They rarely if ever do neck through body either. A hardware & electronic conversion would be where some or all of the original hardware is upgraded with higher quality parts. Usually I replace the tremolo, tuners, pickups, wiring, jack plate, nut, pick-guard, knobs, screws, strap pins and electronics. I have also replaced frets, fingerboards, reshaped necks etc. etc. 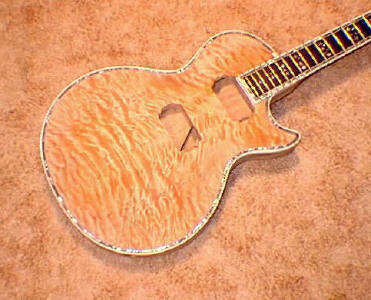 I have done this for several major manufacturers that did not have their own in house custom shop. When a famous pro endorser plays a certain model guitar, contrary to what manufacturers would have you believe these guitars are not what the consumer gets when he puts his money down at the local music store. For example it has recently come to my attention that on Eddie Van Halen's Peavey (ha ha) guitar there will be a Steinberger Trans Trem. Any one who believes that the guitar Eddie is playing is a stock Peavey is living in a fool's paradise. I suppose the folks at Peavey don't want Eddie's more gullible young fans to see Eddie ever play his Steinberger again. The Peavey Wolfgang guitar ushered in a new age of high quality and good value to Peavey's guitar making enterprise. Today Peavey is a strong contender in the guitar world. A left-handed conversion is usually offered when a manufacturer fails to recognize the needs of the left-handed players. The usual way this is done is to disassemble the right handed version, Then fabricate a new body usually a mirror image of the original. Then it's lovingly reassembled and set it up so that it plays better than the original did. Notably PRS or Ernie Ball don't currently offer a left-handed instrument at this time. They must think that left handed people are not viable customers. 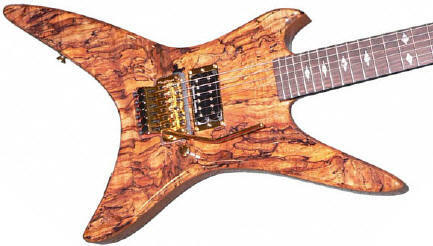 The double-neck conversion is pretty much the same concept as a left-handed conversion. Instead of making a left-handed body, I construct a new double-neck body, utilizing one of my highest quality 12 string conversion necks for the other neck. The neck is constructed to the same rigorous standards that PRS or Music Man employs. Great care is given to aesthetics so that the finished product will have symmetry in keeping with the original manufacturers motif. I offer optional 12 string necks, 10 string necks, 7 string necks, Bass guitar necks, Baritone necks, Piccolo Bass necks, Fretless necks and/or anything you can dream up. Some of my best ideas come from your suggestions!! A forgery is not a forgery unless someone tries to tell you it's original. Recently I have been getting a lot of call to convert pointy headstock Kramer's to banana style. I have been Converting pointy BC Rich to traditional 3 a side headstocks for 17 years. Fingerboard conversions say from rosewood to maple or maple to ebony or from maple to snake wood are actually very easy and quite inexpensive. The part that makes them costly is you also need to perform fret job. So the relatively inexpensive fingerboard conversion should be performed when it's time for a fret job anyway. 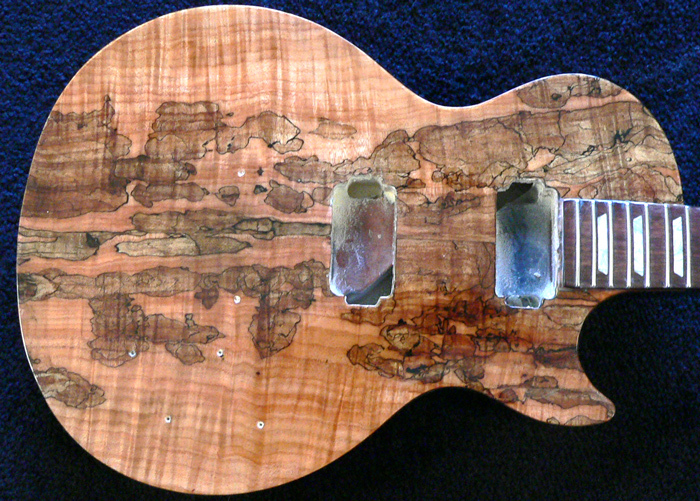 Maybe you would like different inlays on your Les Paul. 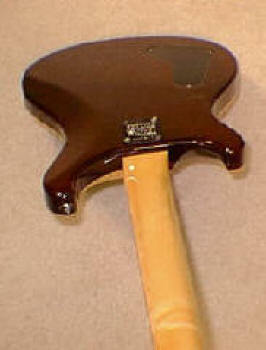 Many players don't like the plastic stock inlays standard and classic models are cheap “Mother of Toilet Seat” (Moto). 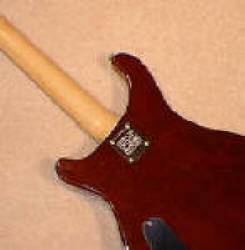 Newer PRS guitars have a very plain MOP inlay. Perhaps you might like paua shell or beautifully figured green abalone, like the original ones came with. I offer many different tree of life designs, dragons, eagles, skulls, crosses, or anything that you would like. I am also offering 12 string conversions to Gibson 335’s, SG's, Les Paul's and Paul Reed Smith Guitars. 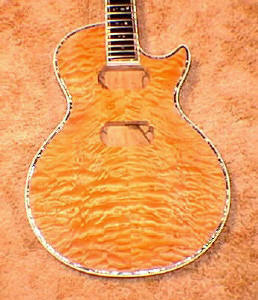 What about a left-handed triple neck PRS styled arch-top guitar made from Korina, Koa and Quilted Maple with tone chambers. A Gibson Les Paul tailpiece on the baritone neck, Steinberger trans-trem on the 6 string neck and slanted frets on the 12 string neck. The necks and fingerboards should all be made from the finest Brazilian Rosewood. 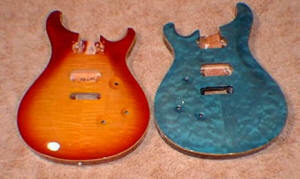 Each neck should sport a different dragon inlay. The binding and purfling on all 3 necks should be figured green abalone. No Problem, just get out your wallet!!! I jokingly used the combo conversion above to illustrate that I can offer just about anything you could want. I must stress that yes, this will be expensive. But I also must stress that if you went to Gibson's Fender's or Paul Reed Smith's Custom Shop you would pay 7 to 20 times more. I will put my inlay work, finishes, woods electronics and setups up against any quality standard that any custom shop anywhere has to offer. What's that You Say? Money is No Object? 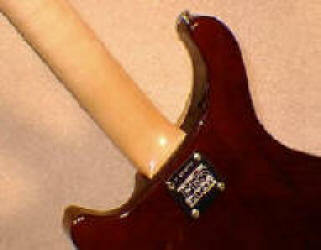 Ask Fender to install A PRS tremolo system for you (never happen). Ask Gibson to install PRS pickups and electronics (Yeah right). Ask Paul Reed Smith to install a Steinberger Trans-Trem or a Gibson tailpiece or even ask them to install (perish the thought) a Floyd Rose Tremolo. Good luck my friend. It will be snowing REAL HARD IN HELL before any of those things happen. In actuality those shops, while being the best at what they do, simply do not offer anything other than their own designated parts. In reality they are not custom shops at all. The word custom implies that you the Customer want something made exactly to your specifications. Ed Roman offers many things that factory custom shops do not. The above are just a few examples. If I replace a neck it is no longer a conversion it then becomes a Custom Guitar, simply because the logo or brand name usually appears on the headstock. ...All major manufacturers are limited by production costs, model changes, etc. etc. The only way a large company can succeed is to offer compromised models that will fit into the budgets and needs of the largest segment of the population. The Guitars you see pictured here started life as stock Fender Stratocasters. 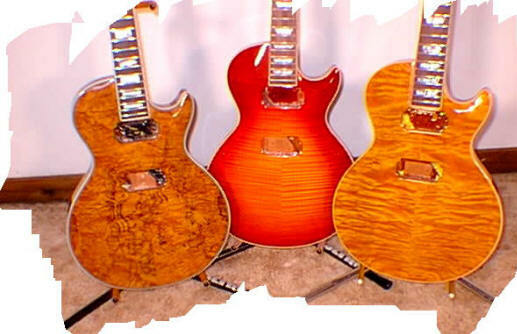 These guitars are tone-wood, hardware and electronic conversions; In fact the only original part on these guitars is the wood that the neck was originally made from. 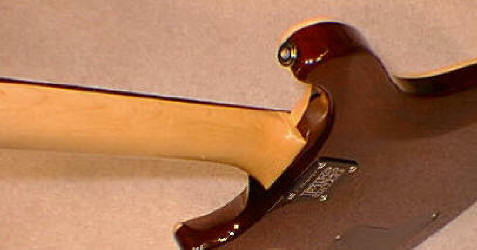 The necks are carved thinner, all the frets are replaced and slab of Brazilian rosewood is installed on the neck. The bodies are solid 1 piece Koa and Korina wood. Pickups are the customer's choice. Tremolo is either a Paul Reed Smith, or a Wilkinson all the wiring and pots have been upgraded to the best available, tuners have been replaced with bright plated super accurate Schaller's all the hardware right down to the screws has been changed. The pickguard is a bright white pearloid. 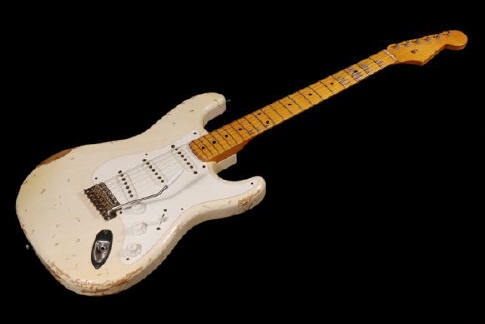 Fender's custom shop uses a less costly pearloid that has a yellowish tint. Of course whenever we build one of these we use parts that the customer specifies. Built to order only. Send us your Guitar we will gladly beat the snot out of it !!!!! Ed Roman has been rebuilding these Gibson Les Paul's for over 25 years. several Gibson endorsers and many individuals. These are built to order only. Paua shell inlay purfling on fingerboard Paua shell inlay on complete circumference of body Completely Hand Built. Starting with a stock Gibson Les Paul, the neck joint is recarved, the top is replaced with a gorgeous book matched quilted or flame maple. Bodies are triple bound using premium bright white binding or abalone, all the wiring and electronics are upgraded, fingerboard and frets are replaced with Brazilian Rosewood or Ebony. Optional recarving and shaping of the neck joint increases the ease of playability and gives the feel of a neck through body guitar. Built to order only. As you can see the front of the instrument looks stock except for the fact that we changed the Gibson pickups out and added a coil splitter switch. Many people assume that the Guitars ACE uses are stock..... NOT !!!! We did this guitar for Ace back in the budgetary days in the 80's before he rejoined KISS, If we were doing it today, I am certain we would be changing the fingerboard, bridge, inlays and probably even the top & binding. 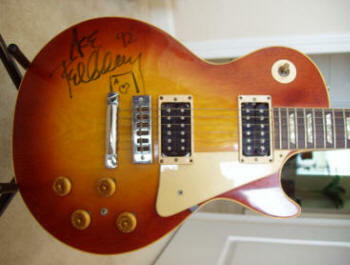 Many people assume that Ace Frehley's guitars were Les Paul Customs, (meaning the model Custom) In actuality they were specially made Standards that incorporated some of the Customs features and some of the standards features. Actually Ace played a custom made standard !! From the back you can see how we removed a tremendous amount of wood from the heel area and the upper back edge. The wood removed modernizes this ancient design a little. I still always recommend a modern guitar if you are an accomplished player. The average consumer doesn't get to see these modifications and simply assumes that these Rockstar Types are playing the same guitars that are available in most music stores. That simply is not true. It's a lie perpetrated on the public solely so that large corporations can sell millions of guitars. Large corporations spend millions of dollars to keep guitar players brainwashed into using their old designs. Typically I only get a few minutes of someone's time to try and deprogram them from a lifetime of brainwashing. Occasionally a smarter than average individual makes the connection and we win one more for our side. All to often though the corporate mentality reigns supreme, the poor hapless lemming consumer goes merrily on his way thinking he knows the score. He rationalizes by saying to himself "I'm not brainwashed, I just like them, I don't know why I like them, I just like them." Think about it for a second, That's exactly what brainwashing and or programming means. How can anyone argue with that mentality !! Starting with a stock PRS right handed guitar. I created new bodies from absolutely the most resonant and beautiful wood I could find. 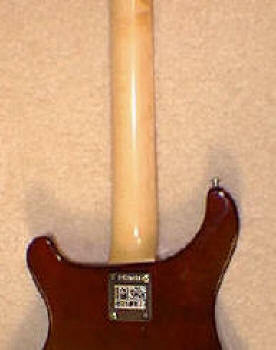 The original PRS neck , electronics and hardware were usually all re-used. Sometimes I used a Gibson Nashville stop tailpiece. As in all my conversions customers always choose exactly what they want. I never alter serial numbers, I never affix decals. (Unless I am doing a restoration) A restoration is not a conversion. These guitars are intended for real players who are looking for the ultimate guitar, but for some cultural reason believe that if they aren't associated with a certain brand name they cannot be personally self validated. Or very often they are endorsing a particular "brand name" (For Money) but are not happy with the quality that the "Brand name company" offers to them. This Rickenbacker model is unlike any of the other Beatle sounding Rickenbackers. In fact it sounds and plays great right off the shelf. with a 24 fret double octave neck through body design. The Stock pickups are also really good. It is available in Chrome or Gold hardware versions. This guitar gets my vote as one of the best guitars on the market for the price. It has all the right components. The price is extremely low. 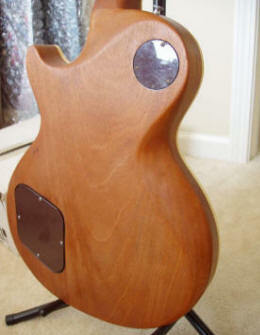 No other low cost American made guitar has a neck through body with 24 frets and a solid Walnut body. The stock pickups are great. The "Black Backs" TM in the customized version are better but the stock pickups are better than most other stock pickups that come installed in most PRS & Gibson guitars. We have done this job 400 or more times and we have never had a problem or a complaint. Not a single complaint !!!!!!!!! Or I can do a return to original stock size short heel. At Ed Roman's, You can have your guitar the way you like it. Not the way some Corporate Geek, says you have to have it. 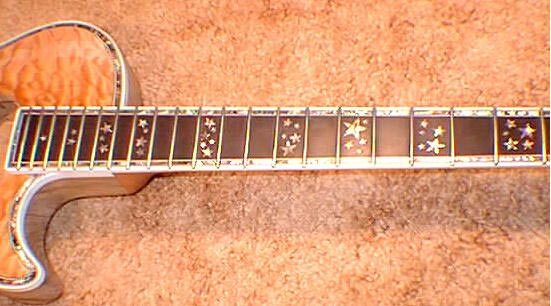 1992 to 1995 PRS used Mother of Pearl inlays on all the Customs. Many people would rather have the Abalone. In 1995 PRS switched to all Abalam. I can convert your Abalam Birds to real Abalone if you like. There are a number of ways to do this job Please contact me for further information.